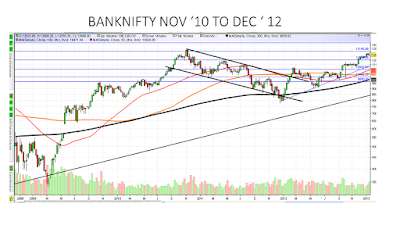 In the Nov '10 - Dec '12 corrective phase, Nifty and BankNifty were pretty much following the same path. 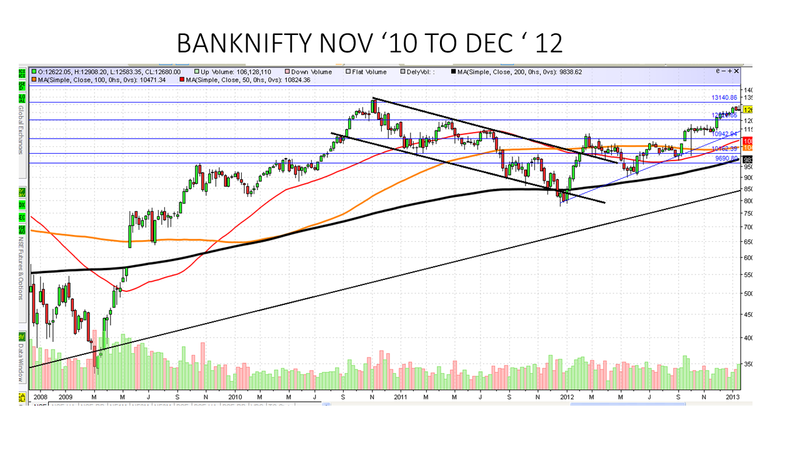 The present price Nifty chart is having the same pattern as that of Nifty Nov '10 chart but not the BankNifty chart. 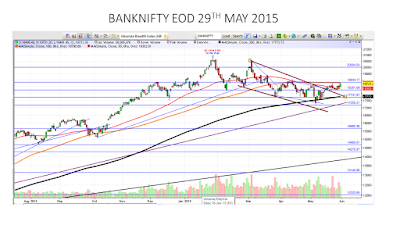 BankNifty also had a corrective channel and that has broken on the upside last week. Of course the Nifty index components have changed significantly compared to 2010 and changes in stocks like Asian Paints, ITC, Sun Pharma have a lot of bearing on the index. 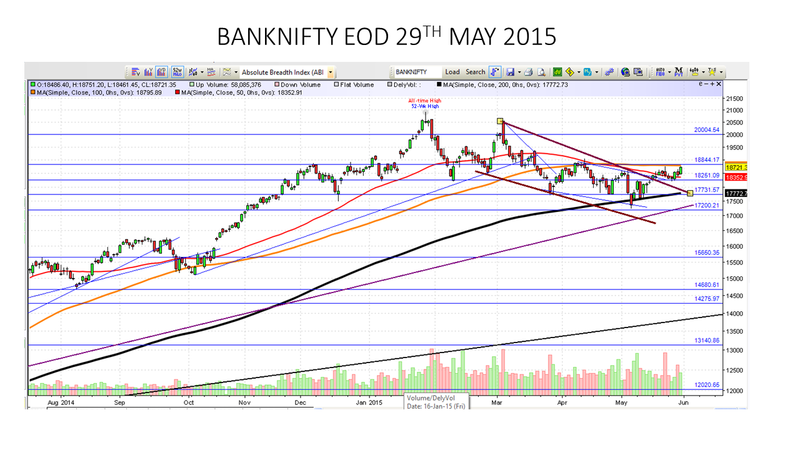 Even with these exceptions, the current divergence on BankNifty is too high to be ignored. 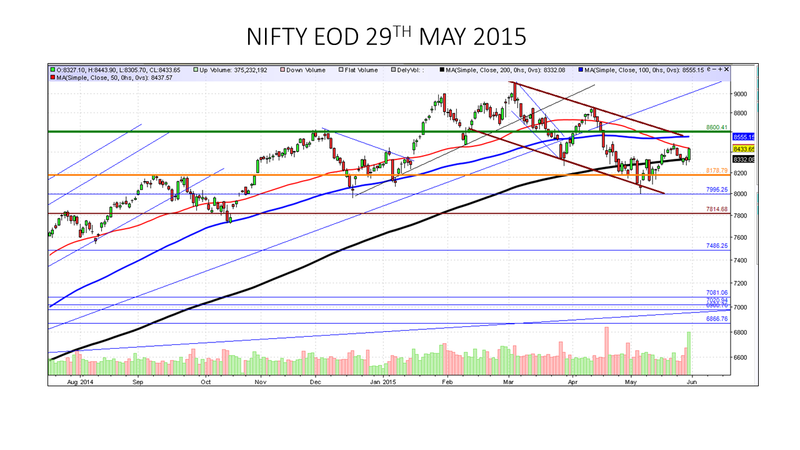 If this is just a rally on expectations of a rate cut on 2nd June, it will fizzle out. 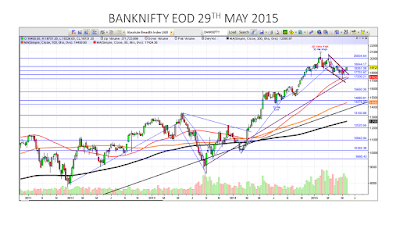 We have to wait and see how BankNifty behaves around the 18800 levels spot and how it pans out. 2 consecutive closes above 18800 on BankNifty implies a large retrace of the fall from 20500 levels to 17200 levels with a minimum target of 19200. On the downside, the 17800-18200 levels should be able to provide support. 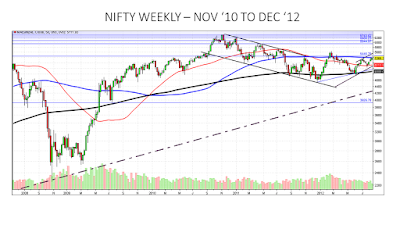 Failure to hold 17800 levels on a weekly basis will give a steeper cut towards 16800. 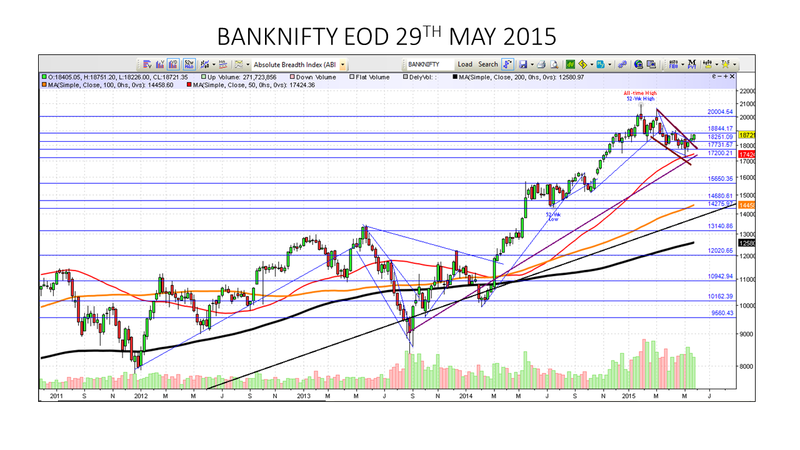 So the jury is split wide open on BankNifty and the range is too large 16800 - 19200 [Definitely not useful for trading]. From a trading perspective, we have to go with shorter time frames. 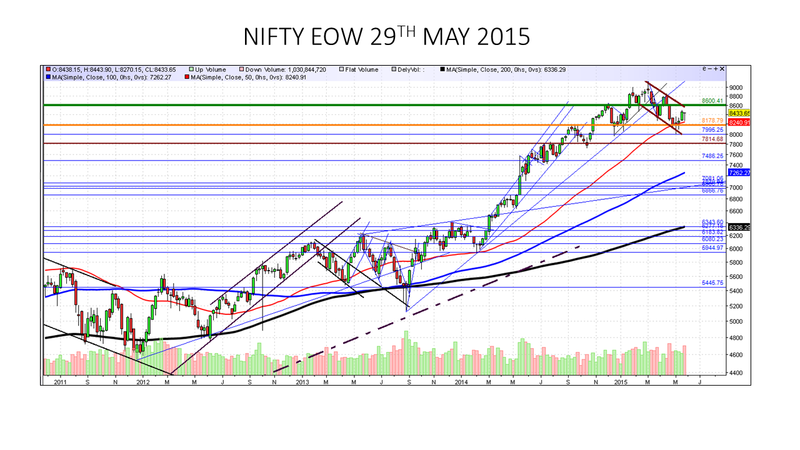 The first sign of danger for bears will be breach of 18800 on upside on closing basis. The first sign of danger for bulls will be collapse of 18250. By 5th June, there should be some clarity on this front. Keep a watch on the Twitter feed for daily levels. There are a lot of expectations on the basis of projects announced by the government and people are wondering why equities are not reacting to these news. As the saying goes, markets discount the future well in advance. Positives from these projects at infrastructure level and public spending were already discounted last year. 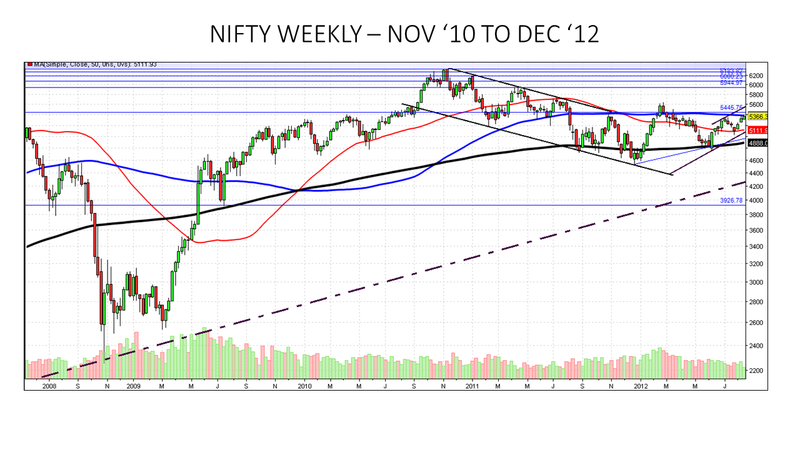 Such panic will affect all markets globally but technicals will eventually rule back. So as far as Nifty is concerned, with such a long sustained tenure above levels attained in May 2014, 7200-7400 is the technical bottom. Short term irrationality may taken levels lower but the rebound will be equally sharp and swift [Remember that the technical bottom prior to Lehman Brothers crisis was 3900 but the collapse continued through to sub-3k levels only to recover] Another difference between the Lehman Brothers collapse and current crisis is that Lehman Brothers was an unknown event. Things were hunky dory and it came as a jolt to people across the globe. This time around, at least with the Euro-zone crisis, the surprise factor is not in the picture. The issue has been in the news since 2010 and given institutional investors adequate time to prepare themselves. Box Office Collections: With the multiplex introduction, we have had so many genres of movies hit the box office over the last few years. In 2013-2014, even movies like Fukrey, Vicky Donor had high footfalls and showed that social mood was turning positive. Over the last 6 months, even big names and big stars have failed to set cash registers ringing. On the fashion front, advertisements were extremely bold, embarrassing parents when they showed up on screens during prime time. Now advertisements are getting even more irrational; "Ghar mein lagao HD color??? ", "Platinum 3G has arrived to Mumbai???" Last but not the least, BFSI companies advertising "This is the sweet spot for equities in the long run" We are approaching a top for sure. Technology has been a great enabler for making life productive. Smartphones, internet and cloud computing are all examples of how automation and technology makes us more productive. However, when valuations reach maniac proportions, it is sign of trouble. Billions of dollars for whattsapp, bookmyshow, olacabs, zomato are signs of trouble. Google has its base in advertising and the same is the case with Facebook as well. Whattsapp despite being a free platform for users, has an extremely high value for larger hi-tech companies due to the fact that it records the mobile numbers of people and will help business analytics tremendously but 19 billion??? Give me a break. We are looking at the same mania in the internet space at the moment. It is due for consolidation and there will be some clear winners. However, there will be far more flops than hits and the entire funding that technology startups are getting are in the hopes of a good IPO. All the discounts that are being showered now can be recouped with a good IPO. As soon as the credit squeeze hits markets due to geo-political and socio-economic factors, technology funding will take a hit. Currently Obama is serving his 2nd term and is in his 3rd year! I am only taking into account 2 consecutive terms of a US President over the last few years and global economic scenario. Truman was the only exception when there was no major economic collapse globally. All countries were trying to bounce back from the debacle of World War 2. What is important is that there is 'statistical correlation' with 2nd consecutive terms of US presidents, especially in their 3rd years of the 2nd term. We are not blaming the presidents here for economic debacles - please that should not be the inference. As Naseb Taleb says in fooled by randomness, "Don't look for patterns in what could just be a cinnamon roll"
From my personal outlook, social mood, Fibonacci and statistical outlook when all these converge towards one outlook - it is too strong to be ignored. Last but not the least, the surge in global equities has in no way created better job situations on ground. So if one keeps on shorting the market looking at these factors on a stand-alone basis, the odds of losing money are higher. What are the major components of DJIA today? Apple, American Express, Visa, Microsoft, IBM, Verizon, United Technologies. From the conventional manufacturing and industrial space, we just have names like Boeing, GE, Merck, Coca Cola, Mc Donalds, Chevron and Du Pont. Boeing is highly cyclical and is on the verge of topping out, GE is increasingly shifting to cloud computing and services as manufacturing is taking a hit. Nevertheless, if Apple, Microsoft, IBM could propel Dow to new highs, these very stocks can pull them down as well. As interest rates reduce, currencies were expected to behave in a certain manner and hyper-inflationary pressures should have triggered economies. 5 years of rampant money printing has had little impact on the US dollar [it has only strengthened], commodity markets have collapsed, and people are flocking to US Treasuries and German Bunds. This is simply because the rules of the game have changed. US dollar and German Bund are perceived as safe havens for separate reasons and hence classical theories no longer work. In older days, the job market and economic activity were positively correlated with equity indices. That is no longer the case. I keep repeating this every month. Gold and Silver have had a 13 year mega-bull run from 2001-2013. So a 3 year correction is fairly logical in terms of time. In terms of price, I think prices have found bottoms in dollar terms. For gold, any severe correction due to deleveraging of institutional speculative positions will still arrest prices within the 1000 dollars per ounce band. All said and done, at sub-1200 levels, most gold mines are making losses. And sub-1200 per ounce prices trigger a great demand for physical deliveries of gold by a lot of eastern nations. Since we are at the fag end of the correction in gold, over a longer term horizon, one can still expect a 10% appreciation per annum over the next 5 years. Silver as an industrial metal is losing sheen but is finding uses elsewhere. It is poised to grow higher again by about 10% per year. 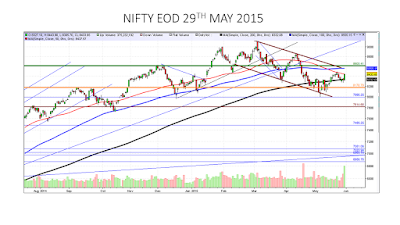 To wrap up, Nifty trend will get clearer by 5th June. The period from 15th June to 30th June will be highly volatile with 21st June Summer Solstice being a critical turning point. 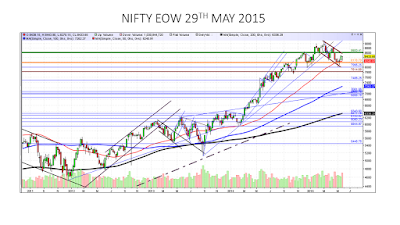 As of now, the range for the Nifty is at 7800 on the lower end to 8625 on the upper end. Should there be a change in this outlook, I will update it on the Twitter feed. Enjoy a happening and exciting June series.